Well, this certainly took me by surprise. 'There have been several questions lately regarding the future of the Star Wars Miniatures and Roleplaying Game and until now I haven’t had definitive answers to give you. After a lengthy evaluation, Wizards of the Coast has decided not to renew the Star Wars license with Lucasfilm. We’ve had a long and fantastic run, but with the economic downturn, we have made the tough decision to discontinue our Star Wars lines. So, what happens with the license? Will it ever be picked up again? And if so, which system would work best for it? AVATAR! AVATAR AVATAR AVATAR!!!! A-VA-TAAAAAARRRRR!!!! Constantly. Every day. This is why I've not seen it yet. I want to see it, but most conversations I have with people either start with 'Have you seen Avatar?' or 'You have to see Avatar!' Yes, I will see it, I actually want to see it, but right now I'm having trouble caring because it's everywhere. I couldn't get excited about it before it came out because I was constantly told that it was going to be so awesome that my eyeballs would explode, and now it's out I'm being constantly told how amazing it is by people whose eyeballs have exploded. I don't doubt it's good, but I really want to go and see it without an preconceptions, you know? Perhaps it's too late for that. - Are more concerned about their characters welfare than they are with the game. It’s important to keep cool during gaming sessions and try to emanate an air of indifference with what the players are doing. You should get dramatic at certain points to try and get across the situation you are emulating, of course, in the form of NPC characterisation and fast, action-orientated narrative but that goes as read. What you have to do is try to appear unfazed by the PC decisions. If you put on a face at a certain juncture when the players have decided to go down a completely different route then two things will happen. Firstly, the players will continue down that route because they see that you haven’t allowed for it, and the more safety-conscious players will go down that path because they stand a better chance of survival. Secondly, they’ll lose that sense of free will. They’ve obviously made the wrong choice of direction and seeing that the GM isn’t prepared for this will make them think that if they did take the path shown to them then they’ve been railroaded into it. The prime enjoyment of play is thinking that you’re playing in a world where anything is possible and being expected to travel down the road shown is a little linear. Losing control of yourself is disastrous. If you get irate, angry, frustrated, annoyed - basically, if you get emotional about what the players are doing outside the context of the game – then that will obviously reduce the players enjoyment. Watching you pull faces, clench your fist, mutter under your breath about ‘damnable players’ and basically lose your edge will more or less stop the game dead and also lessen the tone of future games as the players wait for the carrot on the stick and your angry reactions to their decisions. So, let’s address each of the major game problems one by one. It can be annoying when the players turn left instead of right. What you’ve got to remember is that designing a game that basically signposts the players through an adventure (as is the case with many published adventures) can be dangerous to the atmosphere. Many players, especially those with long experience and well-played characters, will not respond as eagerly to the next step of a scenario as they used to. They’ll be more willing to go off on their own and try to get what they can from the game. This is one of the problems with creating a setting with depth that the players have interacted with for a long time. They’ll take their time recruiting old NPC’s they met, or travelling to faroff locations to get items they might need for the adventure. A scenario designed for a few hours can suddenly double in length. It’s quite simple. You can’t just say ‘you can’t do that’ or simply say that 'the starship has broken down' for the umpteenth time to keep the players in one place. All you have to do is make sure that the situation is urgent, and riding about the kingdom getting help or advice will reduce their chances of getting the job done. You could run a couple of games where the players do go for help, and when they get back it’s too late; the bad guy has had time to fortify defences or carry out their nefarious scheme. Or they could get back and the difficulty of the game has increased over the time they’ve been away. As a drastic measure, any NPC’s they recruited could get seriously hurt, even killed, over what the players had planned. This will make them wary next time they decide to drag someone or something else in to help them. Don’t get annoyed. It won’t be the fact that they’ll feel that their path has been predestined, it’ll be because they’ll think you’re being childish with them and that runs the risk of stopping the games altogether. First, make sure it’s not something you’ve done wrong. Could the game be unoriginal, repetitive or just plain boring? Take a long hard look at what you are doing and be honest with yourself; would you play the game you’ve designed? This one is simple. All you have to do is ask them, what do they want out of it? If they say enjoyment and adventure then they’ve answered your question and they’ll be more willing to take part in the game for the purposes of adventure. If they say they want as much money or as many trinkets as possible then ask them this; what do they intend to do with them after the game is over? What do you remember from the games you enjoyed; was it the fact that you made thousands of credits or was it because you foiled the schemes of the bad guy in a cool and heroic way? Making all that money in the game is good but it’s ultimately false; you can’t spend them when the game is over! The fun from the game is the adventure, not the reward. This one is simple, too. If the players won’t get involved with an action adventure because they are worried about what will happen to the personality they have nurtured, then ask them, what are you playing this for? Roleplaying games are usually about heroes, action adventure, dramatic melodrama and personal strength. It’s not about skulking out of harm’s way, making sure there’s no danger to the character and basically spending the game fretting about what might happen. Don’t just ball your fists and shout, for God’s sake, do something! Just make sure the players have to do something risky to complete the game. If they don’t, they fail, and to compound the problem those who stood to lose a lot from the game’s failure look them upon with some distaste. This can seriously motivate a player to do the right thing. Getting upset will only communicate to the player that they are not doing what you want them to do and the sense of free will goes out the window. 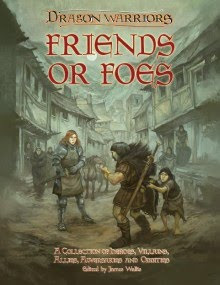 James Wallis of Magnum Opus Press has just announced the release of their latest Dragon Warriors supplement 'Friends or Foes', all about the heroes/villains/innocent bystanders you may meet on your travels through the Lands of Legend. I've not yet bought the book - it's not what this blog is about - but I intend to. I've decided that Dragon Warriors is the game that I am going to buy all the supplements and adventures for as they come out so that I have a complete game collection. I've never done that (although I was two books short of a complete Star Wars D6 collection, until I decided to part with them) and the reason why I'm doing this is not just because it's an excellent game that I really should play more often, but because it's wonderful to be able to follow a game from day one and pick up all the books on offer for it, and not worry about scouring specialist shops or auction websites trying to find that one, elusive book, which is the problem I had with the Star Wars D6 books. Back in the day I was a bone fide collector of different systems - I never settled on a single game - but now I want to concentrate on collecting one game, and I've decided that game is Dragon Warriors for two reasons; 1 - the books are nicely priced and come out sporadically, giving me time to absorb the ones I have, and 2 - it's a way for me to support the British roleplaying scene. Sounds good. Now over to Fatima for the sport. There are different kinds of science fiction. I decide what they are by how brightly they're lit. If you're looking for something brooding and dangerous then it's darkly-lit corridors all the way. Throw in some slowly rotating giant fans to cast some flickering shadows and maybe throw in a bit of smoke machine haziness and next thing you know you're being chased by inconceivable aliens, discovering an age-old mind-blowing technology or you're chasing a sci-fi drug pusher through a mining station. Hell, throw in a couple of neon lights and it's LA in 2019. Now turn up the lights. Whitewash the walls. Now you're walking the corridors of a prim and proper Federation starship, or you're in a sterile functional space station on your way to look at a strange artifact on the moon. 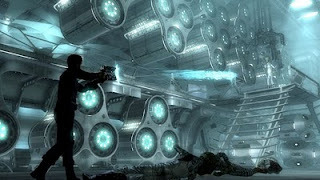 Of course, once you get to the artifact it all gets dark and moody and there's people standing around with giant fans and smoke machines, or when you find the cyborg entity intent on assimilating your species in your engine room the exact same thing happens. Weird, that. The science fiction mood, even the genre, is decided by it's lighting. Remember that, you'll know what kind of film you're in for. The dining room had been prepared, and one by one the players arrive. They sit and talk amiably for the first half-hour, going over what’s been going on since they last met, tales of real life and the imaginary. The game begins. The characters meet their foe and learn of his plans. He escapes. A battle, a starship attack. They meet another NPC who agrees to help them, puts them in touch with another who might help further. They’re double-crossed. More fights and you look at your watch and decide that that’s enough for one week. You wind things down and the players relax, going over what’s happened and leaving. So, the option of locations is a problem, and, as stated before, the normal thing to do is to congregate at your house. Is there something you can do to improve the location you’re in at the moment, try to make the atmosphere right to make the games more memorable? If you do choose to change playing locations you could start by making sure there are no distractions, which will interrupt play and ruin the continuity of the game. If there are others in the house you live in then make sure they know that this night is you’re gaming night and that you’ll need a couple of hours to yourself. The last thing you want is for people to wander into the room and start a conversation as they ‘pass through’. Where exactly is the room you are holding you’re games? If it’s a dining room, which is the only access to the kitchen, then you’ll get people wandering through at regular intervals and spoiling the moment. If there are things in this room that others in the house may need then they’ll be popping in to get it and that will generate the same problem. If that’s the case and you’re limited on options as to other locations in the house then you will have to make do as best you can. Warn the others living there that if they need something then they should get it before play begins. If they have to pass through then make sure they understand that they should pass through with minimum fuss. Not everyone understands the necessity of atmosphere during a roleplaying game, may not even understand the hobby itself, and carry on regardless. Explain it to them politely, asking them if they wouldn’t mind taking you’re group into consideration before doing anything. Getting upset or impatient about it won’t help, and they live there too, after all. Doesn’t concern him? Why is he here then? Look at your game design and make sure that what you have written down has enough in there so that the players, no matter what they do for a living or what they’re skilled at, will have some hand in the game. It can be difficult to allow for every player character, that much is true, but the players should feel as though they’re involved even when another player is performing an action. You should make sure that the players around the table take notice of what’s going on around them. If you turn to a player and ask them for their action and they basically tell you that they weren’t really paying attention, then just shrug. You can’t tell them, the other players will have to. Make sure they understand that if they don’t take any notice then their characters don’t take any notice. You can’t spend precious gaming time re-explaining what happened five minutes ago. Have the other players tell them in character if possible to keep the atmosphere going, maybe even chide them for not paying attention. This way the player won’t feel left out, especially if they’re being told that they’re not paying enough attention through their character. Now, is there anything else you can do? roleplaying items may have opposite the desired effect; there’ll be more things for the players to be distracted by. It should be simple to run and that's what I want - simplicity. Once I'm used to the group and we're all comfortable we can have a conversation about what games we want to play and we can plan accordingly. Maybe then I can run Rogue Trader. If we can attract other players we can then look at hiring rooms and starting the club proper. It all takes time. Rome wasn't built and so on and so forth. Had the first meeting of our new gaming group last night over a few beers (and JD+C's) and it went really well. The new guy Andy is a nice bloke, has got some good gaming experience and seems eager to play. As far as the RPG club 'Lichfield's ORC' is concerned these are the first steps. We're not going the whole rented room approach - we're going to start small and see who else we can entice with our gaming prowess. If we attract more people than we can fit into a room then we look at renting, and the fact that we have all agreed on Sunday afternoons/nights for the game time is a bonus. Not only is that easier to manage it also means we can pull a bigger crowd if the club does take off. Now, I'm going to be GMing the first games and I still have a wish to do Rogue Trader. As it is I want to establish a group dynamic before we delve into the big stuff so I want to keep it simple so we're not spending entire games trying to work out characters and rules. With that in mind I've decided to fall back on the D6 System as I can adapt it to what I need it for and it's easy to run. This way I can concentrate on making sure the group gels instead of worrying about whether I got the rule interpretation right. My setting is post apocalyptic, but not a post-apoc Earth but an entire post-apoc Solar System. Should be fun. And, just so that you see it, here's the new trailer for Clash of the Titans. I'm actually excited about this as it looks like it's going to be another batshit insane fantasy movie, and I enjoyed the 1981 original. I first read this book three years ago, just after my son Bruce was born. It was the book I read during his first two weeks of freedom from the womb and, in between the nappies and the milk, I sat with my son in my arms and read The Carpet Makers. 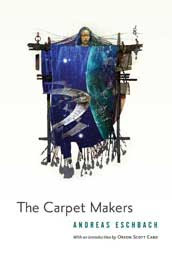 A string of open-ended and seemingly unconnected stories are - dare I use the pun - 'woven' together to create a universe so compelling, so shocking, that it is only now that I have decided to pick it up and read it again. I can't recommend this book enough. Andreas Eschbach is an excellent writer and I am definitely going to hunt down more of his work. One thing that roleplaying games expect is abundant NPCs, non-player characters that populate the GM’s setting with helping hands or dastardly plots. They’re either background dressing or they’re part of the story. The background ones are no problem - you can simply say ‘the citizen points the way to the spaceport’ and that’s the end of that encounter. No serious hard work there. It’s those NPC’s the player characters will be spending a lot of their time with that’ll need the work. This sailing ship captain they’ve hired or that installation commander they’ve kidnapped. The key characters need dressing up. and devious mind and you’ve got an interesting character. Simply basing a personality around an appearance will dilute you’re NPC’s to the point of boring the players. Changing them constantly will keep the players on their toes, or at least stop them from treating the characters as archetypes. When designing a fresh NPC think of MOP and make a separate heading foreach letter of the acronym. Make a brief list of what kind of impact thecharacter will have on the game you’ve designed and then list their MOP statistics under each heading. Don’t put too many reasons under each one - after all, if an NPC is in the game because they want pretty much everything for every reason then you may as well create one stock character and use them for every game. Cue player boredom. M - Motivation: What makes the character do what he does? If they’re brutishand mean, why? Has one of the player characters crossed them in the past?Does he have a secret he’s worried the players will discover? Does he havesomething on him he wants to keep hidden? The motivation for a person is astrong part of the psyche and must be treated with care. If the NPC is going tobe with the campaign a while those motivations may change - hate into respect, keeping the secret into sharing the knowledge. Make sure the change of motivation suits not only the storyline but the character also. A broody, mean character will not suddenly become happy and friendly when something goes right or the players help them out. They may become a little more relaxed, but not a total reversal overnight. Look, I love the D6 system. It's great. I love it's simplicity, it's adaptability and it's ease of use. I ran D6 Star Wars for more than a decade, and also used that first edition rulebook to run all kinds of other settings - Star Trek, post-apoc, fantasy, even my own D6 version of Mechwarrior. I'd go as far as to say that the D6 system is one of the best out there and it deserves serious support. So after reading this thread over at http://www.wegfansite.com/ I can't help but think that the system is in the wrong hands. I've had two projects called 'Scum Of The Universe' and 'Fall Of Progress' in the pipeline, I've even done some serious work on a game bible for the former, with the intention of using the D6 system. In fact, I've had it ready to begin typing up into a game for over a year. I've been waiting on the definitive word that I can use the D6 system for my games but there's been nothing from WEG. Nothing at all. I gave up a couple of months ago but still had a glimmer of hope but lack of communication from WEG and now this thread, and specificially this post has turned me off it completely. I know that there's nothing wrong with the system but whilst all this is going on I don't want to use it. I have to wonder how many other prospective publishers feel the same way. Okay, so this is downloadable content for Fallout 3 (it's also part of the 'Game Of The Year' edition, which is what I have) and is a departure from the post-apocalyptic setting of Fallout, but I'm loving it. I'm loving it because it has that 1950s sci-fi movie feel about it, the way it looks and souns, and the alien blasters/atomizers/disintegrators are so freaking cool in VATS that I want more of it. In fact, they should just make an entire game using this platform and style. A totally wacko 1950s sci-fi shooter (minus the full body and head exploding, perhaps) set in the era of Dan Dare, Buck Rogers, that kind of thing. 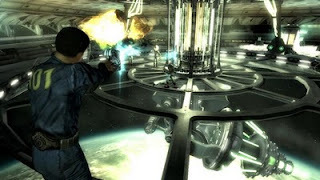 With the mad laser guns and such it would be great fun, a space fantasy with Bioshock decor. I've got images of finding the weakspots on lumbering 'This Island Earth' mutants or fighting off the crazies from 'Invaders From Mars'. It'd just be ace, exploring space in a rocket ship and having FPS encounters with alien scum! Hey! Bethesda! I'll write it for you! I have oodles of pulp science fiction knowledge and Dan Dare was my homeboy! I'm available! I wrote a computer game for Battlestar Galactica, don'cha know! Pick me! Pick me! Then there's Dragon Warriors - I was having another look at that last night and, after watching the classic Robin and Marian movie over the weekend I just want to run that, as well. Damn my overactive imagination. I'm sticking to Rogue Trader and that's that! I finally saw it last night, it's a movie I've wanted to see for quite a while. It's a quite simple review, really - sheer frustration. Everything the character's did in the movie was the exact opposite of what any sane person would do. Honestly, what the hell? Other than that, it was well realised and certainly looked the part. It was just that there were several times I just wanted to punch that main guy out and drag him out of there. Now here's something I stumbled upon on the interwebnet. It's from a 1963 Czechoslovakian film called 'Ikarie XB 1' (edited to pieces for the western world and called 'Voyage to the End of the Universe') and it's a film I've not encountered before. What struck me about this clip is the way it's lit and shot. In fact, dodgy 60s special effects and design aside, I'd go as far to say this is one of the best filmed sequences I've seen in a long time. The shot at 5:58 is particularly gruesome and creeped me out. The whole thing is so well directed and cut it feels like a modern movie has been given the 'cult B-movie' treatment. Of course, I'd have to see the whole movie to fully appreciate it so I'm going to have a go at finding a copy. Let me explain to you why I love the movie Moon so much, why it is such an important film for me and what I hope it means for the future of science fiction cinema. I was born in May 1971 so as I grew up I was exposed to all these new movies full of imagination, creativity and beautiful futuristic designs. 2001: A Space Odyssey, Silent Running, Alien, Blade Runner, Outland. These and others embedded themselves in my mind, and as I grew older and revisited them year after year I was impressed on not only an entertainment level but an emotional one as well. A few years ago I began to miss these kinds of films – in fact, the only one I saw that even remotely reminded me of them was Soderbergh’s ‘Solaris’ from 2002, and even though I enjoyed it I found my appreciation of it slightly discoloured by Andrei Tarkovsky’s ‘Solyaris’ from 1972, a film I was never a huge fan of. I blame Star Wars for the decline in thoughtful, story- and character-driven science fiction films. Don’t get me wrong, I was eight when I first saw it and I was fully wrapped up in the Star Wars love explosion – in fact, I still am. I still love it and still watch it. It’s just that Star Wars changed the nature of these kinds of films. It started the trend of summer blockbuster action-adventure laser explosion battle movies that we see now. Some of these were great movies but the decline, even the extinction, of deeper meaningful science fiction movies was to upset me for many years. I think I realised this after Independence Day came out in 1996. It’s everything I hate about blockbuster science fiction – it had bland characters, an unoriginal storyline, overbearing special effects, awful dialogue and a badly realised conclusion. It was then I realised how much I missed science fiction with much more cerebral content. I wanted to think about what I had seen for days after, be amazed or terrified by the experience. Fireworks are over in a second, inspiration lasts a whole lot longer. I was overjoyed when Soderbergh made Solaris, I’ll not deny that, because I saw it as a return to more thoughtful science fiction. It was excellently realised and shot (the fact that I wasn’t a big fan of the original was my own baggage and shouldn’t have reflected on the quality of the movie) and kept me thinking after the credits had rolled. There was just something missing, something I couldn’t put my finger on. Maybe, in some strange way, the movie had tried too hard to be deep and meaningful. So now I come to 2009 and Duncan Jones’ movie Moon. Here we have a man who grew up with the same movies as me (in fact, he’s only six days younger than I am) and not only wanted to make his own film but also capture the feel and atmosphere of these older flicks. The set design, the story, the special effects were all of the age; models instead of CGI, on-set camera trickery, an involving emotional plot, great design and visuals... this was it. This was the film I’d been waiting for since the mid-1980s, when I’d already exhausted repeated viewings of the old movies and was beginning to become desperate for something less filled with popcorn. The great thing is that I consider Moon to be far better than any science fiction movie that has come out in the last twenty years, and it was done as an independent movie on an incredibly low budget. If these guys can produce this kind of quality film with the resources and talent that they had then this also means that others can do it. Low budgets and cheaper technology means accessibility to filmmakers other than the ones employed by the big studios. That can only be a good thing and promises a great future for science fiction cinema. So thank you, Duncan Jones and all those who helped you make this fantastic, insightful and emotionally charged film. You managed to create something that the Great Movie Machine has failed to do for the last 30 years. I don't care what you're dong tonight, you will find a way to see Duncan Jones' first movie 'Moon', starring Sam Rockwell. No excuses, just see it. I love my late 70's - early 80's science fiction, when it was much more story and character driven and stuck in your head for days afterwards. This is the film I've been waiting for for 25 years. I mean it. See it now. ‘What do you mean you can't come?! ?’ This is a common expression of the GM when a player can't make it to the game. What, then, is a GM supposed to do? A glass is tapped nervously. A small chewy sweet is rolled around the inside of a dry mouth. A pencil is strained to breaking point as the owner applies unconscious pressure. Fingers flex and fist as the time ticks by. One of the players is late. The game should have started ten minutes ago. With a shrill tone that cuts the tension, the telephone starts ringing. Eyes flick tentatively to meet worried gazes and then all stare at the telephone. You tell me, does that sound familiar? Don't you want to throw your rulebooks through the window when a player can't make it at the last minute? It can't be helped. Last minute changes can interfere with a game. It can make matters worse when other players have to do a lot of travelling to attend a game, or the arranged games are few and far between, and they feel as though they have wasted their time. When that one player cannot make it, there is a hole left where he should be. If it is halfway through a campaign, the continuity is warped slightly. So let's get to the point of all this. What is a GM to do when one of his players can't make it for the evening's play? Well, she could try the NPC trick. That's when the absent player's character is run as an NPC, still interacting with the party and generally being played as true to the original character profile as possible. This may cause a bit of a heated discussion when the player comes back, arguing that some of the actions that the GM decided on were the opposite of what they would have done. As well as that, the character could get killed, which would really put a damper on things. The best way to run a PC as an NPC is to only have them pop up when their applicable skills are needed, or when they are required as an extra hand in a confrontational situation. That way, the character is not put at any great risk, and is also not run as a personality but as more of a tool that is used when required, therefore not greatly going against anything the player may have had in mind for it. If the evening's play is not part of an ongoing campaign, and the game is just going to be a quick one-off, so much the better. The player's character can simply have gone off to do something else, such as having a haircut or trying to buy a new coat, leaving the rest of the party to have an adventure. Fair enough, the player may be a bit annoyed that the others have received rewards and he didn't get a look-in, but hey... too bad. The rest of the gamers shouldn't have to give up a night's session because one of the group couldn't make it, and should still be able to get the rewards they earn. carries on like nothing happened. Watch out when using this one. Allowing one of the other players to control the absentee's PC can cause the same kind of problems as allowing the GM to run it. In cases like this, the players might be tempted into using the character to run the risks in the scenario. The chances are that it will be killed by the end of the game, going first into dangerous situations or generally being used as a dogsbody. The other players may get a bit cocky and decide to have a 'bit of a laugh' with the character, and have it do things that get it into trouble, and generally go against the design of the character profile. Allowing another player to control it takes a bit of the burden from the GM's shoulders. After all, it's one less NPC to worry about. It also runs the risk of unbalancing the game. It wholly depends on the attitudes of the players and their willingness to attempt the character correctly. Players cannot always be relied upon to turn up for games, and it's for this reason that collectable card games are a pretty good idea. Although I have never played them myself, they appear to be quite handy to have floating about in case the game doesn't take off for one reason or the other. Having a back-up plan so that the evening won't be a complete loss is always a must, and having another game on hand, be it a trading card game, normal board game, computer game or whatever, is a good thing. This way, the roleplaying campaign won't be altered or held up by trying to fill in the place of the missing player. Why don't you just carry on as if nothing has happened? This way, the game can continue unabated, and when the player returns for the next game she can be filled in with the details of what happened in the last game and then re-enter at a convenient moment. In fact, this is probably the easiest thing to do, and no doubt many groups already do this. Hang on, have I been wasting my time here? Apparently, this is the year we make contact. I hope you all had a wonderful Christmas and a happy New Year. It's January, it's the beginning of a whole new year and that means fresh starts. My New Year's Resolution is to post blogs longer than three paragraphs. I'll start tomorrow.